The days of spending a long career with one company and receiving a gold watch at the end of it might seem like ancient history, but it's not because workers necessarily are eager to leave their jobs. One telling example: even targets of workplace bullying don't always rush for the door. The explanations for this are diverse, from practical to purposeful to prideful. We compiled 10 reasons based on insights shared by workplace bullying experts and targets alike, including Deborah Wilson Gadsden, Family Design Resources training specialist and co-coordinator of Pennsylvanians for a Healthy Workplace. Job satisfaction: Employees typically enjoy their jobs, and targets of workplace bullying are often high-performers who take pride in cultivating their skills, solving problems, fostering relations with clients and co-workers. Before the onset of bullying, they looked forward to going to work. As one victim said, "I love my job. I just wish they would leave me alone and let me do my job." Loyalty: Victims might subscribe to the employer’s values and, in return, feel valued for their contributions. They may have been in the same job and with the same employer for years. To protect: A teacher said she stayed to protect her students, who she said were denied test preparation for state competency exams after she was removed from her job. It is common for professionals who care for the vulnerable, including children, the disabled and the infirm, "to stay in abusive environments to protect others," she said. Another target said she believed she could protect co-workers from unfair treatment. Financial: Who can be without a steady income for long, particularly if you have a family? For this reason, a hasty departure from a job becomes much more complicated and risky. The potential loss of health insurance or negative effect on retirement income also could cloud the picture. Other forms of loss: When you leave a job, you leave behind stability, personal relationships and networks, earned status and leadership opportunities, to name several. Age: A 56-year-old teacher suggested that her age, combined with a "ruined reputation" would make her prospects of landing a job with another school district "very slim." Workers between ages 54 and 65 earned 13.5 percent less in a new job after losing one, according to a Washington Post article. The longer workers have spent developing specific skills, the more limited their career options. Pride: You are the innocent target of bullying, so why should you be the one who leaves? Not wanting to let the bully win can be a powerful incentive to stay. "No one wants to feel like they were run out of their company when they were a good worker and helped to build the bottom line," FDR's Gadsden said. Job search: Ronald Downey, organizational psychology professor at Kansas State University, has researched the topic of why victims stay in their jobs. "We talk about the new workplace where people don’t stay at the same job forever, but getting a job is difficult and people don’t like to do it," he said. A bad referral from a bullying boss won't help. Self-esteem: Targets can feel beaten down and start to doubt themselves, making it harder to make one's case to a prospective employer. Targets can start to believe that the bully was right and that they, the target, "must have been damaged or inadequate" for the bullying to have occurred, one victim said. 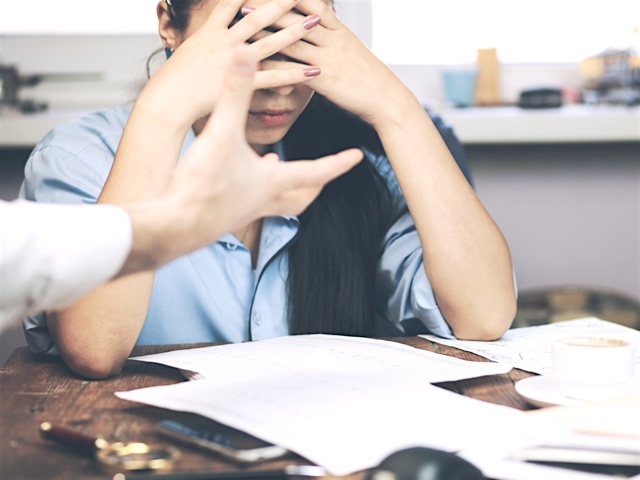 Energy: One target said, "(T)he level of anxiety experienced on a daily basis creates fatigue and confusion such that putting together a job search plan almost seems insurmountable." No matter the reason(s), if you are among the 65 million targets of workplace bullying in the United States, you don't just have to take it. Family Design Resources is both an advocate for healthy workplaces and a resource to employers that want to improve the climate in their workplaces. For more information, please click here.